Find the best hydrating serum for you with Pour Moi! Some days your skin may be oily. Other days it may be dry. Whatever condition your skin is in, Pour Moi has the solution! As you experience various climates, you need to know that your skin is at its best, so you can enjoy the world to its fullest. Pour Moi is here to provide you with the best hydrating serum for you and your surroundings, no matter how much they change. 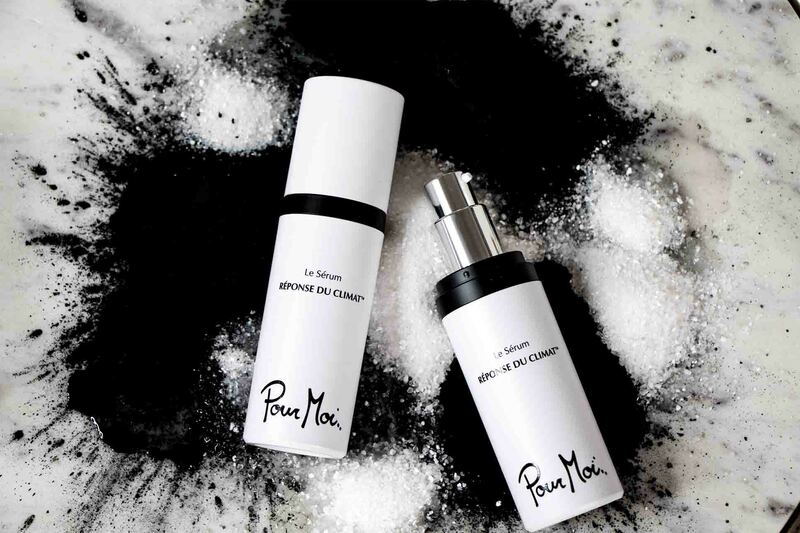 Pour Moi has two innovative skincare routines: Réponse du Climat® Black Ritual, for when your skin is dry, and Réponse du Climat® White Ritual, for when your skin is oily. At the heart of each ritual is a hydrating serum: the Black Serum and the White Serum. These serums work together with your day cream of choice to provide you with the ultimate skincare routine that truly lets you change with your environment! Black Serum is the best hydrating serum for when your skin is dry. Infused with fine black diamond powder, this luxurious serum gently exfoliates skin, sweeping away dead skin cells, and boosting collagen in order to increase skin hydration. The diamond powder also helps massage active ingredients into the skin, down past those stubborn, dry layers. An intuitive blend of vitamins, botanical extracts, white truffle extracts, and other moisturizing agents works to reduce redness and inflammation, and create a strong, healthy skin barrier. A powerful antioxidant, Thiotaine, provides protection from both sunlight and pollution, while keeping your skin young by fighting skin-damaging molecules. White Serum is the best hydrating serum for when your skin is oily. This silky serum works to manage excess oil, using the strength of plant-derived glycerin. Meanwhile, seaweed extract prevents pesky dark spots from forming, and stimulates skin, leaving you with a complexion that is both even and firm. Purified oat extract adds a lifting and tightening effect that is immediate and gorgeous, making your skin plump and smooth. Palmitoyl Tripeptide-38 is also here to lend its anti-aging powers, reducing the appearance of wrinkles and fine lines, while a brilliant combination of vitamins, hyaluronic acid, antioxidants, botanical extracts, and hydrating agents synergizes to prevent inflammation and create a healthy skin barrier. Pump a small drop of either Black Serum or White Serum onto your fingertips, and apply immediately after the Hydrating Balancer, while skin is still moist. Softly pat and smooth product onto the face and neck. Allow the Serum to fully penetrate for a moment before sealing it in with the Day Cream that matches your current environment – whether it’s Tropical, Desert, Moderate, or Polar. And that’s it! You can apply the Serums twice a day to achieve the best results, but remember that less is more. Each time you apply these Serums, you only need a single drop! Wherever you go, whatever the weather, feel confident knowing your skin has exactly the nourishment it needs to remain soft, youthful, and radiant. Whether you use the Black Serum for dry skin, or the White Serum for oily skin, you’ve got the best hydrating serum for maintaining a balanced and beautiful look. Your secret? You change with the climate.